Tailoring and craftsmanship shop CYC Custom Shop has rebranded itself to CYC Made to Measure. The rebranding exercise was done with the aid of brand consultancy DIA. CYC did so as to keep up with changing consumer mindsets and preferences. 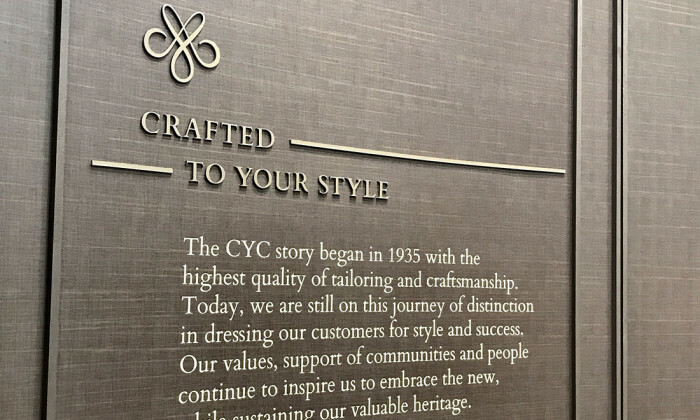 The company felt there was a need to change this perception and encourage new customers especially the younger generation to try CYC made-to-measure wear. According to a statement from the agency, the rebranding exercise was timed to complement the launch of CYC’s flagship store at the Capitol Piazza. The agency also recently appointed Dinesh Sandhu as managing director of its Singapore operation. Sandhu was most recently regional director of strategy, digital and media at Hakuhodo Communications Asia, for three and a half years. Williams Lea Tag will be responsible for providing digital and print creative production, as well as adaptation services to the Ma.. Ocean Terminal Forecourt is transformed into a 3D illustrated swimming pool, featuring six hyperrealist sculptures created by scul..
As the first brand on board, MAB will carry the title “Team MAS Official Airline Partner”, flying national athletes to and from co..